We are going to HOLLYWOOD ….. Florida …. that is, and you ask WHY? Because we are meeting Radeen’s Sister and Brother-in-Law who are flying out from NM to a timeshare on the beach here. 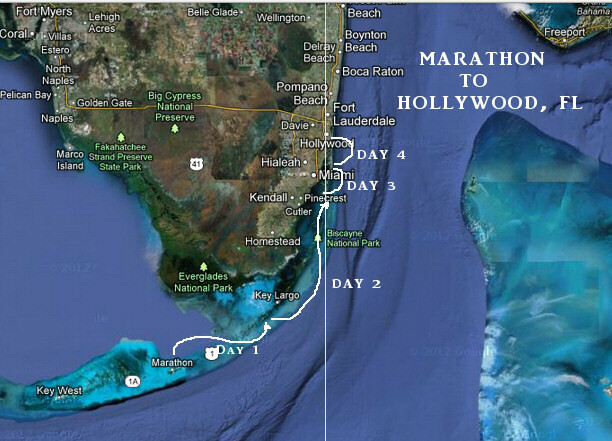 We have moved the boat from Marathon in the Keys to Miami and then north up the ICW 15 miles to Hollywood. Yes, this is back tracking but we had planned to return to Miami after our Keys visit to continue to learn about the beauty of Biscayne Bay sailing. So, the only back tracking is the 15 miles north of Miami to Hollywood. Now we are docked in the Hollywood City Marina where we will have a rental car and spend the week together exploring this fabulous coast and the great towns centered around here. On our way from Marathon to Hollywood, we enjoyed anchorages off Key Biscayne and Miami Beach. We transited the Venetian Causeway Lift Bridge East near Miami Beach and learned how to exit and enter this area from the north side. We spent two nights anchored off Belle Island and took the dinghy into Collins Canal, where we walked to Lincoln Road outdoor mall and took in the movie “Lincoln.” The peace of living on anchor at Miami Beach is really great. We enjoyed sunsets over Miami to our west and the bright lights of SOBE to our east. The holding is great, with 10 feet of depth, a sandy bottom and little current. What a joy to anchor off Miami Beach, one of our new favorite spots. Now it is time to discover Hollywood Florida with its famous boardwalk and all the town has to offer. We waved to the passengers on their balconies! Due to construction, we waited nearly two hours for the Dodge Island Bridge to open!. Vessel “Fountainhead” on Miami’s cruise ship dock. This Super Yacht is Owned by MARK CUBAN ! A new 62 foot Power Cat motors north off South Beach at sunset. The 79th Street Causeway Bridge opened just for us! The Sunny Isles Bridge is a double bascule. Vessels are instructed by the bridge tender to wait until all lifts are fully raised. Hallandale is a contrast of old and new, large and small! 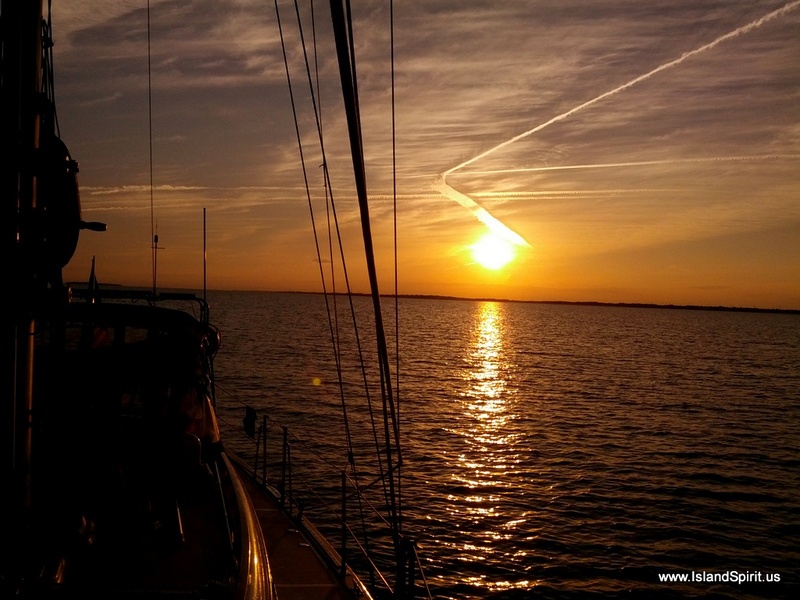 The more we learn about South Florida boating in the winter time, the more it becomes a new favorite, due to the availability of anchorages and sailing in Biscayne Bay. The great cities and towns are even better than we expected! What have we been doing since January 5…??? 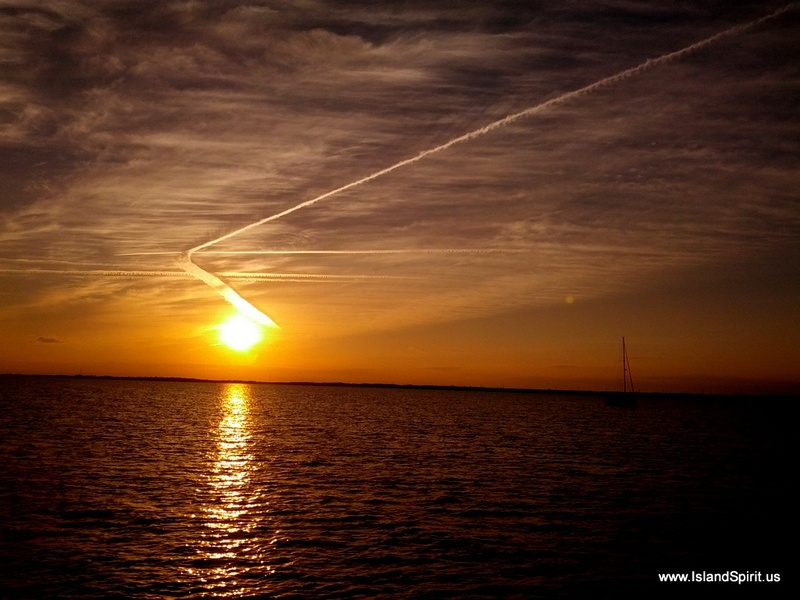 ….Weeks of simple living and peaceful life afloat on the boat in warm sunny Fl…. Installing the SSB radio took 5 hard days, but our last two weeks at Harbour Cay Club weren’t all work! 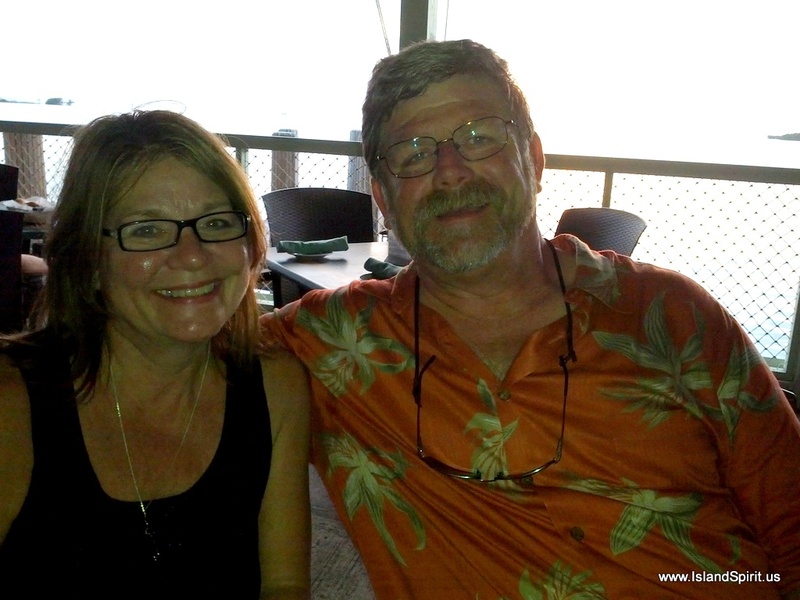 Kathy and Alan Huffman of IP-420 Flatlander came to stay in the condo for three days so they could meet the HCC group. They kindly offered transportation to ALL the transients, in search of dog food, hardware and provisions. We enjoyed the Pelican Key Information Center and learning about Flagler’s railroad. On their last evening, they made a delicious meal in the condo for Chuck and Lynn. What a delightful time! We always enjoy the Tiki Hut gatherings for sunset, large and small. There were several group expeditions to Lencho’s for Mexican, The Stuffed Pig for breakfast and Lazy Days for happy hour. We really enjoyed our first Eric Stone music event at Salty’s. We had a few potlucks on the lanai, including a delicious cold meal of spinach avacado soup, freshly smoked pork and turkey, salad, bread, strawberries with orange dip and coconut cranberry truffles. Perfect for a warm evening and memorable as our last potluck together with some of our wonderful HCC friends. After leaving Marathon, the greater part of four days was spent studying for the Ham license exams. Our hope was for one of us to pass the second level, so that we may use Winlink.org, a free SSB e-mail service. Mission accomplished! We both passed the Technician Exams and Radeen passed the General Exam. A big thank you to Keith and Blanca of IP-31 True Love for planning an interesting day in Ft. Lauderdale and providing transportation from the boat to the exam. Our celebratory dinner together afterwards was lots of fun! So, Hayden installed the radio, Radeen passed the needed HAM General Exam, and it will now be Hayden who learns how to set-up and use Winlink.org, proving once again that we make a great team! We had planned to re-explore and re-enjoy Miami and Miami Beach. We have family visiting next week and the closest they could get was Hollywood. We planned to sail over to the Bahamas Feb 9th or later. Biscayne Bay is FANTASTIC and has so much to offer with so many anchorages. We LOVE IT! We wanted to return. We decided to add an ICOM 802 SSB and a Pactor III/USB modem for voice communication, weather data, and email access, especially related to Chris Parker, our weather information subscription service. We had originally thought that we would buy an Iridium 9555 satellite phone and use OCENS email services. Then we discovered the issue of minutes prepaid for a specific time period which then expire, in addition to the contracted monthly services charges for access. We figure that within 2-3 years of satellite phone use, we will have paid for all SSB equipment, so we opted for the SSB instead. Little did we know HOW MUCH WORK it would be to install and set up, let alone to learn how to use the beast! The install took us 4 days full time, including installing the radio, the modem, GAM antenna, KISS counterpoise grounding system and a number 8 power wire directly from the battery bank. Now we are up and running, testing the transmission and reception of the unit. It is working great! We bought everything except the antenna and grounding system from Gary Jensen, owner of www.DockSideRadio.com in Punta Gorda, FL. Gary sells kits that include all the ferrite chokes and special line filters that make for a great install. Gary also includes a 50 page book with step by step directions on how to install the unit and set up your radio. We had a bid for $900 to install the SSB, so we decided to try it ourselves and we were successful. I credit this success to Gary Jensen, who was exceptionally helpful via cell phone calls, text messages, and his well-written book. Thank you, Gary! The completed panel – this was the EASY part! Our first few days of testing have been on the Marine Channels only, since we are not yet HAM licensed. On day one, we heard from Colorado to North Carolina, to George Town, Bahamas all from Marathon FL. This is a range of about 500-800 miles. On day two, we transmitted with a check-in on the daily Cruiseheimers’ Net. The net controller reported a “Clear Voice and Good Signal” from George Town, Bahamas. So, we are very pleased with our install and our set up. Our next goal is to install and set up SAILMAIL and we are also preparing for the HAM exams. We will see how that goes. For now, we have a working SSB and, from what we understand, that is a big accomplishment for a self-installed unit! Here are a few photos of the install. I designed the shelf so it can be dropped for servicing the radio and modem. to the right under the desk. This install took away zero space! So, if you are thinking of an SSB install, then I recommend that you visit Gary Jensen’s web site and buy from him. He will gladly help you out and make sure you get your SSB rig up and running. Radeen and I would read their stories together as the emails and blog posts came in from around the world. We marveled at their adventures and long passages. We emailed them in the South Pacific, loved the photos of them off Sydney Opera House, enjoyed their land travels in South East Asia, and followed them into the Indian Ocean and Red Sea via Pirate Alley, through the Mediterranean and finally while crossing the Atlantic. Luckily, we were in Marathon as they were heading to the West Coast of Florida and so they came to HCC for a few days, http://HarbourCayClub.org, where fellow IP owner Capt Jim is an HCC owner and where several IPs spend the winter. We all were honored to celebrate their circumnavigation together! The celebrations on the dock. First dock since the the MED ! The many flags of the Countries they visited ! Celebrations under the TiKi Hut for sun downers and stories are continuing. Driving in were Capt Jim, IP29 FORTUNA, Keith and Blanca of IP31 TRUE LOVE, Mike and Carol of IP31 NOMAD. Chuck and Lynn are amazing people, and they are very FUN to be around. I thank them immensely for their years of sharing their accomplishment of this incredible dream. They are looking forward to moving back to land and returning to gardening, woodworking and painting.Their new home will be decorated with beautiful pieces of native artwork from their circumnavigation. Well done, Lynn and Chuck! in appreciation for all the support over the years! WOW, this rig and gear was sailed around the world! WELL DONE CHUCK and LYNN….world sailors! The famous TIKI HUT where we enjoy gathering at 1700 hrs. 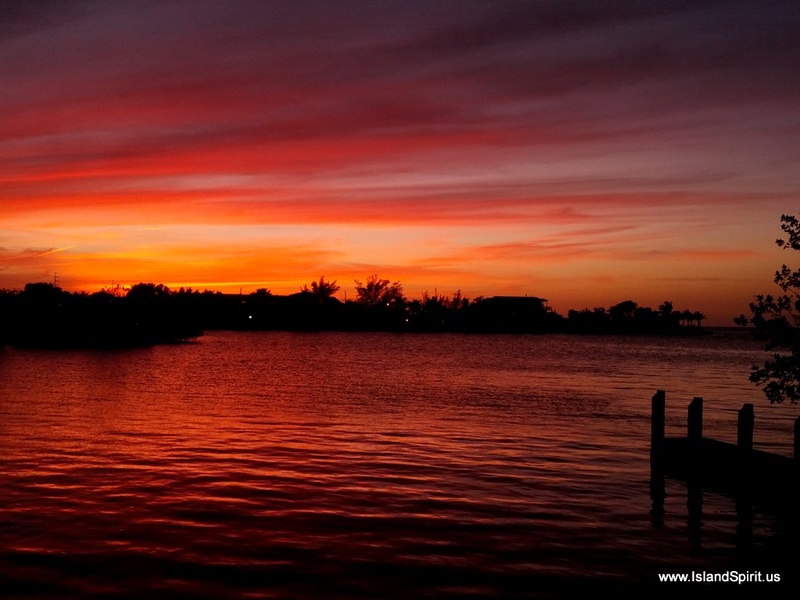 Our pet Pelican overlooks one of our sunset gatherings…. It is a true honor to be in the company of Chuck and Lynn and to hear their stories and discussions of sailing around the world. Radeen and I are amazed at how easy they say it really is. JUST KEEP GOING WEST and you will sail around the world. Thank you Chuck and Lynn for seven years of emails, photos, blog posts and adventures, we were there with you the entire time…….and we loved it….Thank You! We have used this site for years and have always been happy with it. I’ve visited 400 cities in 42 countries.